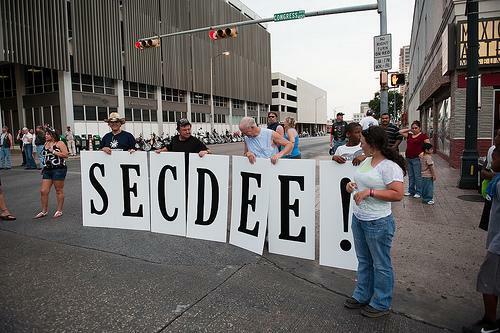 Secede!!!!!!! - Miata Turbo Forum - Boost cars, acquire cats. Just like all the people who "left" the US and went to Canada after Bush won. Google says 25,674,681 people live in texas. 23000 want to leave? Big whoop; they probably voted for Nadar too. It's stupid, any retard can go out and get 150 signatures (which is the minimum need to petition for secession.). 29 thousand you say? Whats that? Like .11% of the texas population? please don't make me laugh with this nonsense. Also, just so you guys know.. the current texas petition for secession has been up since 2009 and only garnered 29k signatures.. I was told the Texas petition has 63000 signatures this morning. Plus, the average texan isn't known for their high political intellect. Easily manipulated by what seems to fit their "image". It got a spot on the news tonight. Count was up to 75k according to them. There's also another petition to "Deport all those who signed petitions to secede from the Union". It has garnered 8k signatures. All this **** is hilarious. lmao I will definitely sign that one! Nobody is actually seceding from the Union. Nobody actually thinks they're going to be allowed to secede. It's a symbolic eff you to Obama. I hope it makes him mad. Last edited by vehicular; 11-16-2012 at 02:19 PM. Is it stupid to say that this junk is a good example of why we are a republic? Cause I'll go ahead and say that if people think it is smart. The gravest problem facing the electoral system is undoubtedly the electorate. "Austin Texas continues to suffer difficulties stemming from the lack of civil, religious, and political freedoms imposed upon the city by less liberally minded Texans. It is entirely feasible for Austin to operate as its own state, within the United States, in the event that Texas is successful in the current bid to secede. It is important for Austin to remain in the union as to do so would protect it's citizens' standard of living and re-secure their rights and liberties in accordance with the original ideas and beliefs of our founding fathers. We would also like to annex Dublin Texas, Lockhart Texas, & Shiner Texas." Residents of all states who wish to secede from the union should be required to take their own advice about 'personal responsibility', and pay their share of the national debt before being released to fend for themselves. This debt must be paid in full, or they cannot leave. This means no federal assistance, period. Abridged list includes no more upkeep for highways, nor for interstates or bridges, no federally funded law enforcement or fire department, no public libraries, no phone lines, no cable television, no cell phone towers, no power grids, no water lines, no mail services, no paramedics, no hospitals which accept Medicare/Medicaid funding, no ATF, FBI, DOJ, SWAT, or Department of Homeland Security, no Border Guard, National Guard, Coast Guard, Corps of Engineers, or WITSEC." I like how conservaderps on TV and radio are clinging to this story, it's all they have left after Jehova betrayed their destiny. I'm sure we've all seen those cute images of "The World According to America" and such. Ran across one depicting "America as seen from Europe" which made me chuckle. So it's kind of pointless for Texas to secede. Got a spot on the news today, so I had to look. I can think of a lot of reasons that our state will never successfully secede...oil being one of them.